Just by looking at sweet Finnegan you would never know the story that lies beneath his shirt. Under a thin layer of clothing lies a tapestry of scars each one depicting a life saving event that brought him here today. The two most noticeable are the zipper that perfectly separates his chest in half and the raised jagged lines where his neck was sewn back together. On Friday January 13th, 2017, Finn Olson made his grand entrance into the world, at home. Being born in the bathroom, unassisted, was not part of the birth plan however the Olsons would soon find out that nothing about Finn was going to be according to their plan and his exciting birth was going to be the most uneventful part of his first-year earth-side. After a completely typical pregnancy and passing all the routine ultrasounds prenatally the Olson family eagerly awaited the new addition to their growing family. Big brother Asher, mom Ali and dad Jeff were looking forward to finding out their second child’s gender at birth. That surprise quickly turned to fear as their newborn son showed signs of oxygenation issues. He was breathing fine and a perfect hue of pink, but the midwife had concerns. After a few blissful hours in the comfort of his own home Finn was brought in to The Minneapolis Children’s Hospital for routine observation. After several tests, x-rays, prophylactic antibiotics and 24 hours of no change, the nurse practitioner called for an echocardiogram to look at Finn’s heart. The silhouette on his x-ray appeared large and the team wanted to dig deeper. Two days after Finn was born he was diagnosed with hypertrophic cardiomyopathy. His heart was 5x the size expected of a newborn. With the help of a betablocker Finn was able to recover enough to go home for two short months. The doctors hoped he would outgrow his condition, although they were skeptical. After 64 days as a family the Olsons were once again torn apart. But this time, Finn wouldn’t be returning home with his own heart. He deteriorated quickly upon readmittance to the hospital and ended up on ECMO through his carotid and jugular on the right side of his neck, essentially heart/lung bypass. 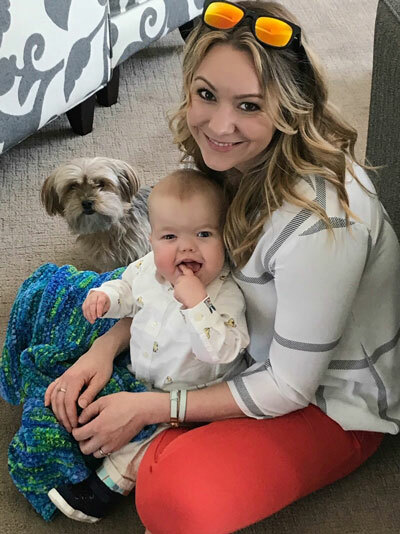 On May 1st, 2017 at three and a half months old, Finnegan Olson was listed as a 1A for heart transplantation at The Mayo Clinic in Rochester, MN. For 73 days Finn’s heart and lung function was moved to a machine. He was unable to be held, sit up, do tummy time or eat. His parents would take turns commuting to the Ronald McDonald House to watch over him while the other stayed in the cities with Asher. On the weekends they would spend time together as a family in Rochester. The moments and days would creep by slowly as the family held onto the only thing they could, hope. On Thursday July 13th, Finn’s half birthday, Ali received a phone call just before 6 AM. It was the call they had been holding on to hope for. Finn was set to receive his perfect heart. The emotions were overwhelming as this is what they had been waiting for, but the realization of how it came to be was unnerving. How can a moment of such joy be filled with such sadness? As a family who came close to losing their own so many times, the awareness of the situation was not lost on them. Finn’s recovery was not an easy one. He suffered more setbacks than most. From kidney failure and lung issues to infections and two runs with rejection early on. There were times that the Olsons didn’t think Finn would ever come home, even though he received his new heart. Then, just as quickly as he had gotten sick, he started to show signs of recovery. After 200 days in the hospital Finn was discharged at exactly 9 months old, on October 13th, 2017. Finn is one of the lucky ones. Although his story is a tumultuous one it is also one of resilience. Finn is proof of the will to live and the gift of organ donation. Pediatric organ donation is a difficult topic as no one wants to address the death of a loved one, especially of a child. If it weren’t for the choice that one selfless family made, Finnegan wouldn’t be here today to torment his big brother, snuggle his puppy or share sloppy kisses with his mama. Finn’s laugh never lets on to the trauma he has endured and there is no child that is happier to be alive. Finn and the Olsons have a donor to thank for the happy ending to the very short and sad story that is Finnegan’s life so far. They hope to be a part of enhancing awareness of the good that donation can bring to those who are so deeply in need of life saving organs for their children. They honor their donor family by living their best life full of tickles, stories, songs and adventure. Jeff and Ali feel a tremendous responsibility to both Finn and their donor and they spread love, awareness and education wherever they can.